Reliable, affordable, and hassle-free services from your trusted mechanic in Boulder. Choose An Auto Repair Team That Always Puts Customers First. When it comes to local auto repair in Boulder, The Shop Automotive is the most trusted name in the business. With highly skilled, trained, and certified technicians on staff, our customers can rest assured that they are getting premier service without an outrageous bill. Just give us a call and we’ll provide you with further details and costs for our auto care service in Boulder. 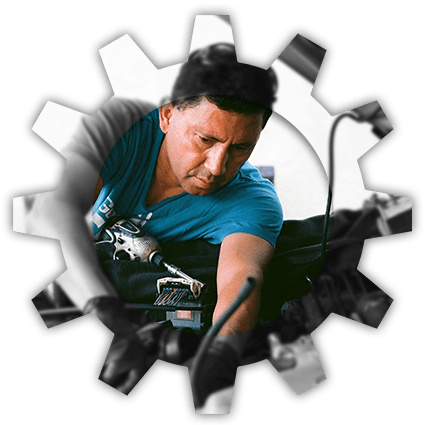 At The Shop Automotive, we make certain that every customer receives individualized attention from one or more of our expert technicians. In fact, our team will be fully transparent with you throughout the process, whether your vehicle is in need of a simple tuneup or more extensive maintenance. Learn more about the auto repair services we offer below. The Shop has all of the latest technology and industry know-how in order to perform comprehensive auto diagnostics on all vehicles. Never will our certified technicians resort to “guesstimating” when it comes to figuring out what’s gone wrong with a car or truck. Not only will The Shop find the problem, but we will fix it. From oil changes to crankshaft seals, our team provides full-service engine auto maintenance on all vehicles. As a driver, the last thing you want is to be stranded on the side of the road. So the next time that dreaded “Check Engine” light appears, stop by The Shop Automotive and give your engine the maintenance it needs for optimal performance. Shifting should be a smooth move. Whether your car is manual or automatic, shifting troubles could spell problems with the transmission. At The Shop Automotive, we handle issues such as low transmission fluid, leaking transmission fluid, and torque converter failure, among others. Stop by The Shop today for a full analysis. You don’t want to mess around with a car that’s too hold or too cold. Especially in Colorado, it’s imperative to have a vehicle with a functional HVAC system. So do away with being uncomfortable in your own car and bring it to The Shop Automotive for heating/cool repairs. Is your ride feeling a bit bumpy or pulling to one side? If so, there could be a problem with the suspension system. Whether it’s a sign of worn or damaged shocks and struts, low power steering fluid, or worn shock absorbers, our technicians have you covered with speedy, hassle-free service. Brake failure can put your safety and the safety of other drivers at risk. If you hear squeaking, grinding, or have other problems, bring your car or truck to us for reliable brake repair in Boulder. Keep in mind, also, that our 36-month/36,000-mile warranty covers the majority of brake repairs. It’s a scary feeling to not have full control of your vehicle. Fortunately, our technicians are Boulder’s steering repair pros. We will inspect, diagnose, and repair your vehicle’s steering problems with precision. When buying a vehicle, you want to be 100 percent sure you aren’t getting a lemon. The Shop Automotive can help with pre-purchase inspections. Our technicians will look for evidence of any existing or potential problems before you’re on the hook for them. If you want a mechanic that always puts your best interests first, choose the technicians at The Shop Automotive. As opposed to a dealership that often makes customers wait days on end for maintenance to be completed, we get you in and out so you can get on with your life. Contact us today and see for yourself what makes us Boulder’s choice for auto repair.